Although Nick Foligno skated after the team practiced, coach Todd Richards still thinks he's a couple of days away from returning to the lineup. PITTSBURGH — Ahead of Game 2, RJ Umberger is making his return to the lineup after being out with injury. Although he has been to the playoffs before, this is a big game for him. He’s a Pittsburgh native that calls Columbus home now. Columbus head coach Todd Richards was asked what he expects from Umberger in Game 2. "I’m expecting him to come out, play fast and play big. He’s one guy, what he’s done well consistently all year for our team is he’s gone to the net and played hard at the net." "That’s one thing that he’ll provide. He’s a guy that’s from this area. It’s a payoff game where he’s coming home and playing in front of a lot of friends and family. He’s going to be a good addition to our team." 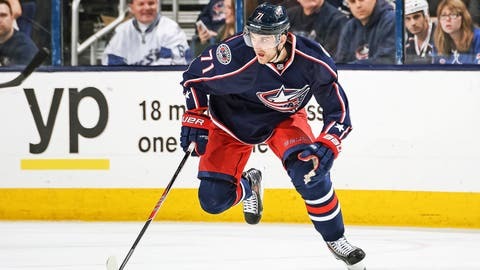 Nick Foligno’s return was questionable for Game 2. Although Foligno skated after the team practiced, Richards still thinks he’s a couple of days away from returning to the lineup. "We’re hoping that he’ll be ready to go in Game 3", said Richards. "He’ll skate today and tomorrow and then we’ll make that decision either Sunday night or Monday morning. I’m assuming it will be Monday morning after our morning skate." Columbus winger Blake Comeau thinks his team needs to stay physical and clean up penalty kill for playoff success. There’s no surprise that Columbus came out in Game 1 with a physical game and look to continue that into Game 2. Todd Richards doesn’t look at keeping a tally of hit. Rather, he sees it as them playing within their identity. "I don’t think we come out with the intention of running up the ‘hit count’. But, that’s part of our identity and how we play. We want to play fast. This is a team (Penguins) that if you’re turning pucks over, they’ll make you pay. So we have to manage it. A lot of times it’s dumping the puck in and getting in on the forecheck. And, that usually leads to a hit." Now that Game 1 is out of the way, Todd Richards spoke of the lessons learned by the team as they prepare for Game 2 tonight. "The big thing for me," he said, "and our group was just getting our feet wet. Sometimes, it being your first time, you don’t really know what to expect. What is it going to be like?" "A lot of coaches and a lot of players talk about the playoffs and what it’s like. There’s the anticipation of that. But, you’re still unsure. And I think just going through it, the crowd, the atmosphere and the Penguins… it’s a larger scale." "Once you get into the game, the lesson learned is that it’s still just hockey. It’s still a game (where) you have to skate, you have to pass and you have to shoot. You’ve got to try to score more goals than the other team." Other than the addition to the lineup of RJ Umberger, no other changes are anticipated ahead of Game 2. The Blue Jackets would dearly love to win this game and take the series back to Columbus tied at 1-1 for Game 3 on Monday evening.